The double coin knot is a simple and attractive knot popular in Chinese knotting. But, like many knots, it goes by several other names and has uses that are both practical and decorative. 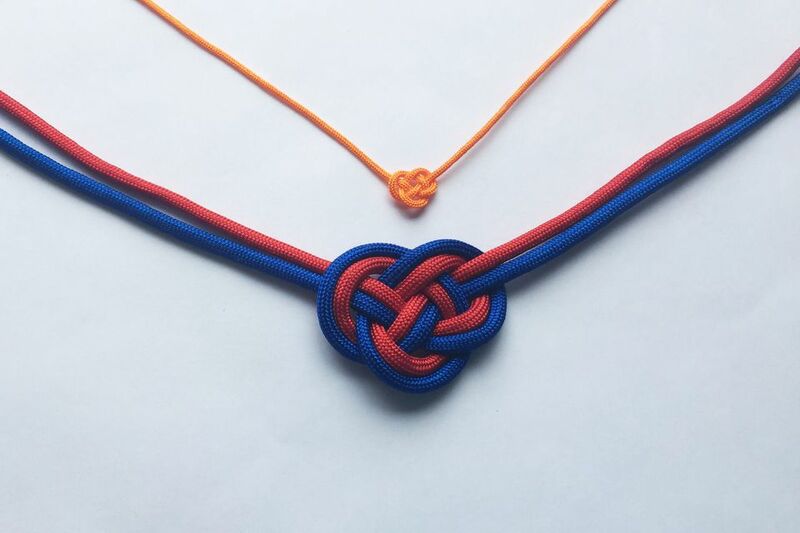 On the practical side, the double coin knot is a variation of the Carrick Bend and is sometimes also known as a Wake Knot, the name evolving from its' use in British heraldry. In macrame, it is called a Josephine Knot. Although these knots may go by the same name, the Double Coin Knot variation is typically tied using a single cord. 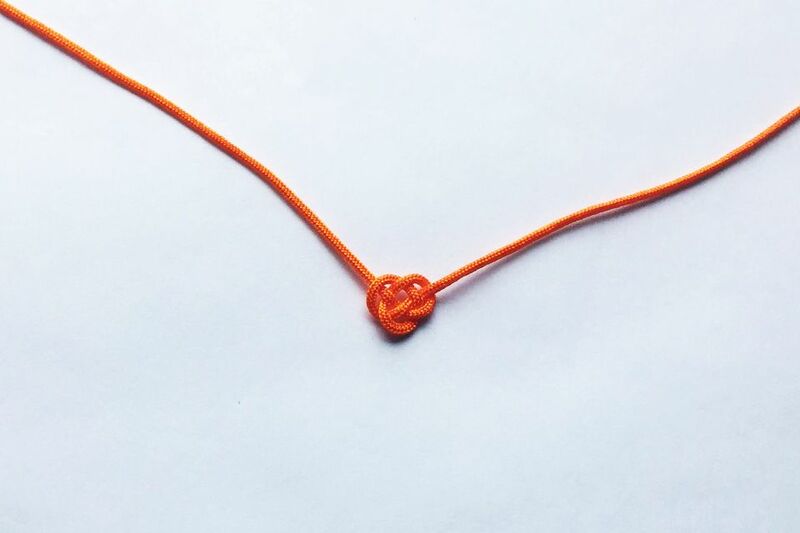 The Carrick Bend and Josephine Knot typically refer to a knot that is used to securely join two pieces of cord. Setting the variety of names aside, the double coin knot is easy to learn and versatile for jewelry making. The double coin knot can be made with a wide variety of jewelry making cords. When you are first learning, it is easiest to start with a thicker nylon cord. These types of cords slide easily, making them easy to tie and adjust, but also have some texture which helps the knot hold in place. Once you have learned to tie the knot, you can go on to trying it with different cords. It can look especially good with doubled cords, which makes a thicker, more exuberant knot. You can even add beads to your cord! Start with a scrap piece of cord, at least eight inches long. You will need room to loop the cord around multiple times and maneuver the end through the center of the knot. When making a knot, the cord you are manipulating to tie the knot is known as the working cord. Take the working cord and make a loop to the right side. The base cord is on a diagonal towards the bottom left. Using the same working cord, make a second loop overlapping the first one. This looks a little like a lopsided bow. Complete the loop by sliding the working cord under the base cord. To help see the over and under weaving from this point on, there is a piece of wire on the end of the cord in the picture. This makes it easier to slide the cord, as well as easier to differentiate the working cord from the base cords in the picture. To make the knot, slide the working cord over the last loop and under the next cord as shown by the wire in the picture. Be careful to maintain the alignment of the first two loops of cord so you can weave through them in the proper order. Weave over and under the next two cords from the first set of loops following the example in the picture. Gently pull on the working cord to start forming the double coin knot. To fine tune the knot, it may be easier to flip over the coin knot so it is facing down. This is how it's typically used in jewelry making. Simply pulling on the two cord ends will tighten the sides of the knot, but leave a large loop in the center. To make the knot sit properly, the cords must be pulled from the center and adjusted gradually to reduce the slack. Ideally, each of the loops should be adjusted so they are similar sizes and the cord is not twisted as it rounds the corners of the knot. Double coin knots look great when they are tied in leather cord. It is a little expensive to learn with leather cord though, so practice with nylon cord or scrap pieces of leather. The center loop of the double coin knot is the perfect spot to add a pendant or dangle. Choose a jump ring that is slightly larger than the cord, open the jump ring by twisting to the side and slide on the center loop of the cord. Close the jump ring to secure the pendant. Double coin knots look especially pretty when made with two different color cords. The technique for the double cord is the same as a single cord, but it is slightly more difficult to keep the cords flat and together while tying the knot. Be patient and make adjustments gradually and you are sure to be delighted with the results!